Sometimes, a speaker simulation is a valuable tool. It's convenient to plug a fuzz box into a simulator and go direct to a mixer or recorder. There are a few commercial boxes that allow you to do this, as well as a few DIY circuits. The Marshall simulator is popular. A few use the Bulldog Cab Sim from Stoned Tone. Others use Jack Orman's AMZ Cab Sim. All are excellent and highly recommended. RunoffGroove set out to create it's own simulator to address certain needs. The RunoffGroove mandate of simplicity is still in effect, so parts count will be low and it will be made of readily available components. We want a "Simple Simulator," if you will. The goal is to mimic the sound of a single mic on a single speaker. We've chosen to simulate an open back cabinet, Fender style. The core of the design will be multiple low pass and high pass filters. The filters are a simple RC setup. Economy of design is important, lest we redesign the wheel. There are already excellent, but more complicated designs out there. Please check them out if this design sparks your interest. The circuit consists of two jfets in a common source configuration. Jfets were chosen because of the high input impedance and smoother breakup properties if overdriven. 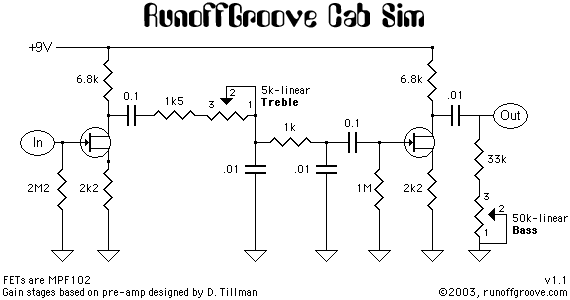 Following the first jfet, is two low pass RC filters. The first filter is adjustable. The 5k Treble pot set at maximum will place the corner at 10kHz. When turned to minimum, the corner will be at 2.5kHz. This will afford some adjustment of the amount of high frequencies that are allowed to pass unaltered. 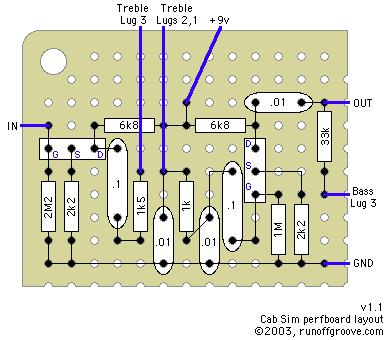 The second RC LPF is fixed around 15kHz to eliminate some of the harsh treble frequencies generated by fuzz boxes. These two filters working in tandem provide a fairly smooth treble rolloff that increases as you move up the frequency band. Next is the second jfet gain stage, set to recover some of the volume lost in the filtering process. On the output of the second jfet, we have a variable simple high pass filter, composed of the output cap, 33k fixed resistor, and 50k pot wired as a variable resistor to ground. With the Bass control at maximum, the low end goes down to 192Hz. When set at minimum, the corner of the filter is set at 483Hz. NOTE: if you cannot find the specified MPF102, other FETs can be used, but the 6k8 drain resistors should be replaced with 50k trimpots. Adjust the trimpots for 4.5v at the drain of each FET. Thomas Pflüger (aka "tomboy") kindly donated this PCB layout, which uses a 10mm grid for the resistors and a 5mm grid for the capacitors.